Neuschwanstein by train . 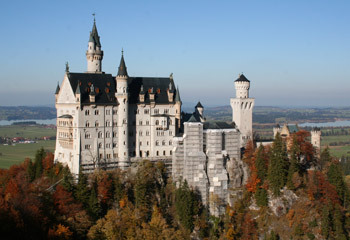 . .
Neuschwanstein Castle is just one of King Ludwig II of Bavaria's fairytale castles. Built in 1869 as an extravagant folly, it's now a major tourist attraction. Bavaria's fairytale castle, Neuschwanstein (www.neuschwanstein.de) is near Füssen, south-southwest of Munich, close to the Austrian border. 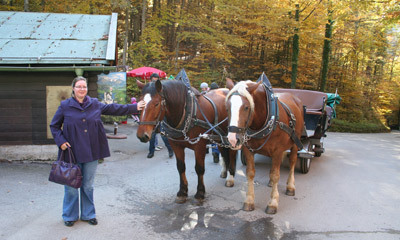 You can easily do it as a day trip from Munich, no need for a tour, just do it independently. This page tells you how. Travel from the UK to Munich as explained here or take a train to Munich from any other European city as explained here. Pre-book this to get cheap advance-purchase train fares. Regional trains link Munich Hbf with Füssen every hour throughout the day, journey time 2 hours 2 minutes. You can check train times & fares at www.bahn.de. No reservation is necessary or possible, trains cannot 'sell out', just turn up, buy a ticket and hop on the next train. It's that simple. The cheapest option is to buy a Regio-ticket Allgau-Schwaben ticket (€23) or a Bayern Ticket (€25 for the first passenger + €7 for each additional passenger) which both give a day's unlimited travel on regional trains (after 09:00 on weekdays, any time at weekends) so will cover a one-way or same-day round trip. The regular fare is around €27 each way, only pay this if you need to leave before 09:00 on a weekday. Although you can buy on the day at the station, buying online beforehand at www.bahn.de saves time and the system automatically shows the Regio-Ticket Allgau-Schwaben or Bayern Ticket for journeys where these are cheaper than the regular fare. 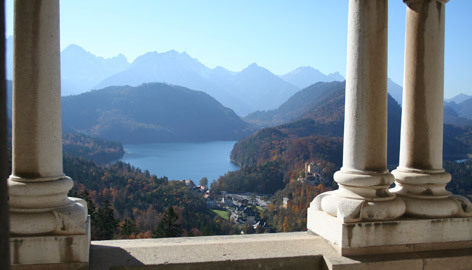 Step 3, take bus 73 or 78 from Füssen to Hohenschwangau. 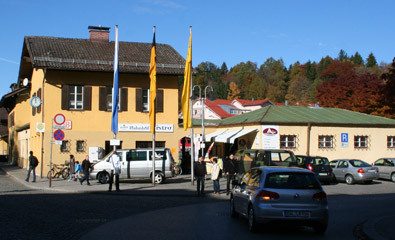 The buses leave about twice an hour from directly alongside Füssen station. The journey time is about 8 minutes, fare just a few euros, pay the driver when you board. For information on these buses see www.rvo-bus.de. Hohenschwangau is the tourist village which has the castle ticket office, restaurants and shops - buy your ticket here, or pre-book a ticket with a specific visiting time at www.ticket-center-hohenschwangau.de at least 2 days in advance. 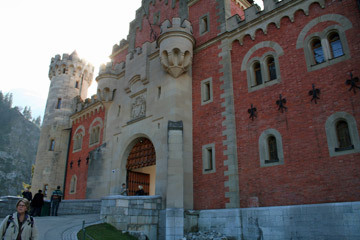 It's a 40 minute uphill walk, 20 minute horse-drawn carriage or 10 minute shuttle bus ride up to the castle. 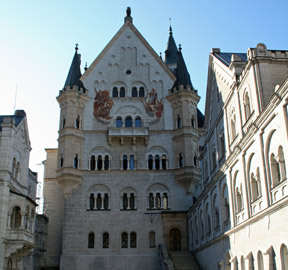 Neuschwanstein Castle is open every day of the year except 1 January & 24, 25, 31 December, check opening times & admission fees at www.neuschwanstein.de. 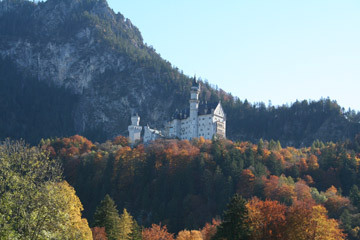 This photo shows how Neuschwanstein nestles against the mountains on the edge of the valley. Behind the castle, walks hug the mountainside, so make sure you allow time for a wander. 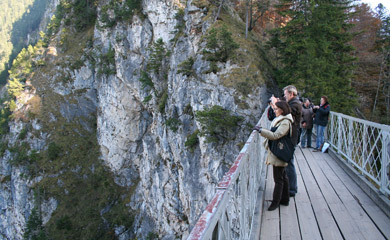 The dramatic Marienbrücke footbridge (above left) leaps from one cliff to another, giving great views of the castle. 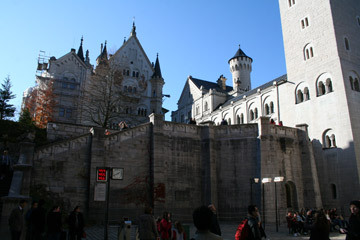 This is the classic view from the Marienbrücke bridge behind the castle, looking towards the plain.